Broken Spoke, credit Winker Withaneye. 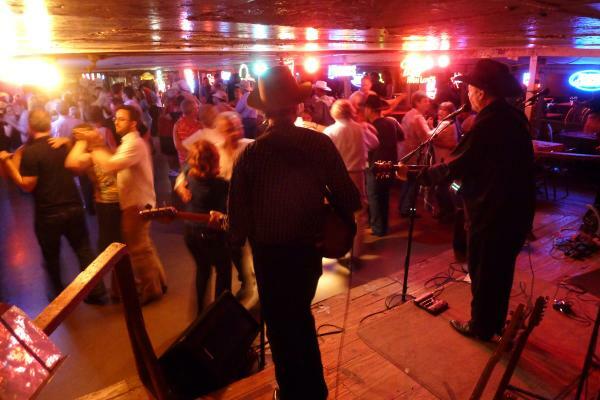 What would Central Texas be without a good old fashioned honky-tonk? Voted “Best Dancehall in Texas” and the occasional home to local hero Willie Nelson, Broken Spoke is the perfect place to satisfy whatever two-stepping urge you might have (they even offer lessons four days a week!). This iconic venue may be in a new location, but its spirit is still the same. On any given day, you can catch blues from local artists such as co-owner Gary Clark Jr. to legends such as W.C. Clark. If you’re a fan of blues rock in any way, shape or form, Antone&apos;s is a can’t miss. Looking for eclectic and diverse music outside of traditional American genres? Sahara Lounge should definitely fit the bill, with musical performances ranging from African to Samba-influenced sound, guaranteeing a fun night of grooving. A mecca for live jazz in the heart of Downtown Austin, the Elephant Room has been a staple of the live music circuit since 1991. Every night features live music from accomplished musicians, local and international, in a perfect lounge setting for drinks and company. A no-frills bar with a no-frills attitude, Beerland is only interested in one simple philosophy: getting everyone to rock out as loud and as hard as possible. Located in the Red River District, Beerland boasts an authentically grungy vibe without the slightest bit of pretension, making it an ideal destination for punk and metal bands to thrash away the hours. Whether you&apos;re watching DJ’s spin or a rapper spit, there’s always an act for hip-hop heads to enjoy in Austin thanks to the vibe and inherent love for music that flows out of Empire Control Room & Garage. Don’t forget to check out the garage and back patio in case it gets too crowded in the Control Room! Explore more live music venues with our Venue Guide and keep up with local happenings by following @MusicAustin on Twitter and Instagram!